On my everyday bicycle the cable for the rear wheel brake runs along the top tube, where there are limit stops brazed on at both ends and the cable runs without housing in between – a solution, which is very common on many bicycles. 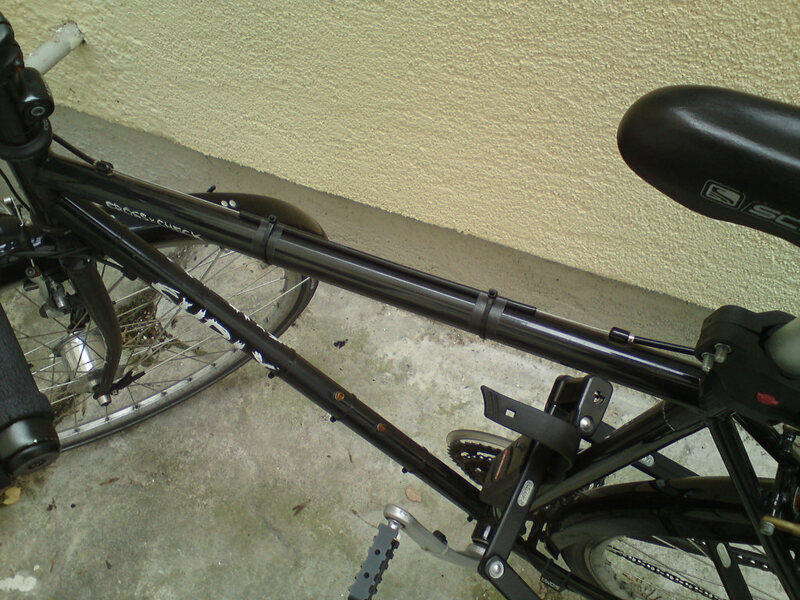 The problem: Without applying the brake, the cable tension is very light, so the cable easily starts to swing, when the bicycle is vibrating, for example when driving on cobble stone pavement. The result is a more or less audible “jingle” on the tob tube, which can be quite bothersome. To avoid damages of the paintwork, there are special rubber rings, which can be put onto the cable. They may preserve the paintwork, but the noise emission will not be reduced considerably. They may even cause the opposite, depending on the material. I therefore decided to use another variant: A short piece of Magua hydraulic pipe, made of plastic, which is fixed to the top tube with textile tape and cable ties. The hydraulic pipe is rigid enough, so it will not be compressed by the cable ties, but it also provides a sufficient inner diameter, so the movement of the cable will not be affected. The textile tape avoids any horizontal movements of the construction on the top tube, where the ties will fix it additionally. Visually, it needs getting used to, technically it works perfect – no more “jingle” on bumpy paths and the correct function of the brake is not affected at all. Another alternative would have been, to run the housing in one piece from the brake lever to the brake and to fix it on the top tube. But this would also have increased the friction in the system and would not have been possible without additional attachement points on the top tube.